Burton is one of the UK’s premier menswear retailers. From mens suits and shirts to casual, stylish jackets and shoes, they have it all to make an affordable wardrobe for university. The great news, we can confirm there is a Burton student discount. To get the discount simply go to this page on burton.co.uk and start shopping! Then validate your student id and you’ll get a special voucher code to use online. For full details check out our dedicated setion. If you’re in-store then show valid student id card at the till. Plus there is currently a 30% sale now on for selected lines. First, check out out the contents box below. We’ve divided this guide into easy chapters to follow so click on any relevant links and the page will scroll to that section. Is there a Burton NUS, Unidays or Student Beans Discount? There are often a lots of Burton sales and codes released for Burton so it can be confusing as how best for students to save when shopping at burton.co.uk or in-store. That’s where the Student Squirrel steps in. Ready to bag some big Burton savings? Let’s get this show on the road! There is a standard Burton student discount and at the absolute minimum you should get the 10% Burton student code. There are times throughout the year with 20% off so look out for these. You can get the discount both in-store and at burton.co.uk. How to get the Student Discount Code for burton.co.uk. Head to this special page on burton.co.uk. You’ll be issued with a unique 10% voucher code. Add your fashion items to the basket and at the online checkout enter your promo code. Beam from ear to ear about your 10% reduction! If you are in a Burton’s store, then just show valid student id at the till and you’ll get a 10% discount too. Check out our Squirrel savings section at the top of the page for the latest sales, promo codes and offers that could save you more than 10%! There is a permanent sales and offers page on burton.co.uk with selected fashion lines with big reductions. Plus we think you still get the extra 10% student discount! Did you know that there are short term Burton promo codes that are sometimes bigger than 10%. Again we will list these in the savings section. The biggest savings can be made when there is a sale on. Check out our sales chapter for the diary and we’ll also have them listed at the top of the page. 2. Is there a Burton UNIDAYS, NUS or Student Beans discount? The 3 biggest students discounts websites are NUS, UNiDAYS and Student Beans and each of them have a different offering. We get asked a lot whether there is a Burton student discount through these schemes so we’ve done some extensive researching so we can answer your questions properly! So the good news is that there is a Burton UNiDAYS student discount. To get it you need go to this page on adidas.co.uk, put your awesome football boots, trainers or sports clothing in your basket, then get verified with UNiDAYS are you’ll be issued with a student voucher code to enter at the checkout and bob’s your uncle you’ll get a terrific 15% reduction on all full priced items. So this is a tad confusing so bear with us. There is no NUS Burton scheme at the moment for students to save. This includes not being included in the NUS Extra card scheme. HOWEVER, NUS students can still get an Burton discount through the UNiDAYS scheme and get the voucher. Nope, there is no association between Student Beans and Burton. This would make things easier for students, but you can still get the 10% promo code for free through UNiDAYS. Make sure though that you do check out the outlet page too as there are bigger discounts there to be had. We hope you’re enjoying the Squirrel guide so far. Keep reading though to get some more clever savings tips! First things first, students are entitled to a promo code to get 10% off their purchases. Check out our savings section for full details. What we like about these voucher codes is that anyone can use them, you don’t have to go through the fiddly process of verifying your university, school or college status. We list all current general discount codes at the op of the page in the savings section so make sure you take a look. Using the codes are easy, just do your shop on burton.co.uk, get to the check-out and enter the code and the relevant reduction or offer will automatically be applied. The way students can get the biggest discounts on their menswear is when there is a big Burton sale. These typically happen at selected dates throughout the year but there are some times you can guaranteed to get a 50% saving and sometimes even more. Burtons like to go big on Black Friday and Cyber Monday and usually release a voucher code to get 30% off everything. This is double the normal student discount so is really worth waiting for!!! Around mid March Burtons have a mid-season sale and also something for Easter too. Around the end of July there is a huge sale with big discounts off spring/summer mens fashion at Burton. We’ve seen discounts of up to 70% and you can still use your student discount code on top. Excellent time to shop if you’re headed on holiday or to the beach! We like to unearth some of the best Burton bargains for you young educators so take a look at some lovely deals on quality fashion and accessories. A classic shape and style, this black watch is an instant hit and looks considerably more expensive than it is. The strap is actually leather-look rather than leather (so no animal cruelty concerns here) and the face is silver-coloured that won’t rust or fade. Every man needs a basic watch, and this one is perfect for both formal and informal occasions alike. Formal Suit Hire, 2-day try-on period – FREE! Burton stores all offer hire services for formal suits and occasion wear so that you don’t need to fork out the full amount to purchase an outfit that you’ll only ever wear once. Store staff will even size you up so everything fits just right, and unlike other suit companies, Burton give you a full two days to try and wear the items at home to decide whether or not they fit the occasion the way you’d like them to (perfect for weddings and other big events where you need to compare your outfits to others). A wardrobe staple for all men, this long sleeve crew neck tee its for everyday errand running and lecture attendance but can be dressed up with tailored jeans and premium trainers for a smarter feel. It’s 100% cotton and machine washable for easy maintenance. This is a great cheap buy for every man’s t-shirt drawer! So there we have it. We’ve shown you that not only is there a fantastic Burton student discount but also how it’s possible to save even more. Through shopping during sales to using promo codes, there are some clever ways for pupils to get fashion for cheaper. We wish you luck and let us know how you get on. Burton Menswear London is a 115-year-old menswear and suit retailer that now features on almost every high street across the UK. Part of the Arcadia Group, who also manage the likes of Topshop, Topman, Dorothy Perkins and Ms Selfridge, now has over 400 stores across the country and is well reputed as a must-visit when shopping for guy’s clothing. Burton has such a reputation for design and aesthetics that when the business started expanding, it hired an architect to ensure its exterior building and interior store design was consistent across all sites and really made a distinction between it and its competitors. These stores, where designed externally, were art deco in style and all looked broadly the same – with large non-retail rooms available upstairs for billiard halls, black fascia for signage, industrial-style metal grates and tiles spelling out the store name around the door. Many of the stones laid for these first stores were done by the Burton family, and several still exist today. Some of these locations are protected by preservation orders in both England and Scotland so remain in place today, even if they’re not still used as Burton retail stores. Today, Burton is considered a premium high street menswear retailer. Their current range includes suits and suit/occasion wear hire, smart casual clothing (think chinos and smarter t-shirts over ripped denim and logo tees), shoes and accessories. The price points are reasonable rather than luxury, and their sales and clearance events throw up some real bargains that put them firmly in the Student Discount Squirrel favourites category! It’s preppy and smart tailoring with a casual price tag. There are over 400 Burton shops in the UK and numerous more worldwide, but if there isn’t a store near you, their website offers their whole range as well as some online exclusives and a clearance section that offers discounted rates on items unsold in stores. What’s more, there’s a 10% Student Discount as standard and a further 15% code available if you sign up to their email newsletter. If you’re not sure about a purchase, you can choose to ‘try it and pay later’, giving you up to 30 days to model the items at home before you have to pay for them, or return them (for free!). There’s not a credit agreement in place, but you can also choose to ‘slice’ your payment on orders over £60 and spread out the cost across three instalments so that it’s more affordable for you. This customer-friendly option makes buying pricier items such as formalwear easier. 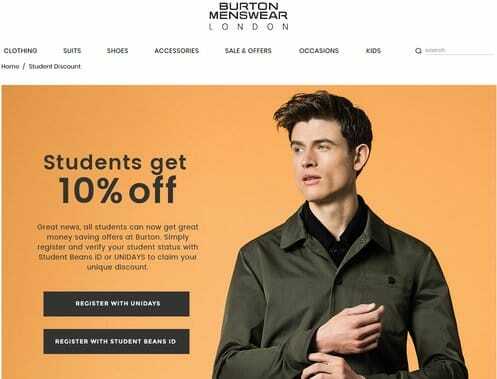 Burton’s range of payment options and their frequent sales make them a discount and student-friendly retailer, and one you can easily nip into a store of should shopping online not be your thing. When buying adidas trainers, football boots or clothing make sure you check out the Sports Direct student discount page. For trainers JD has a great range including Stan Smith and Superstar and a 10% code. Foot Locker of course has a great range too and click and collect. If you fancy something from there big rivals, Nike has a 10% code for students. Burton’s in shop style was famous for being Art Deco!